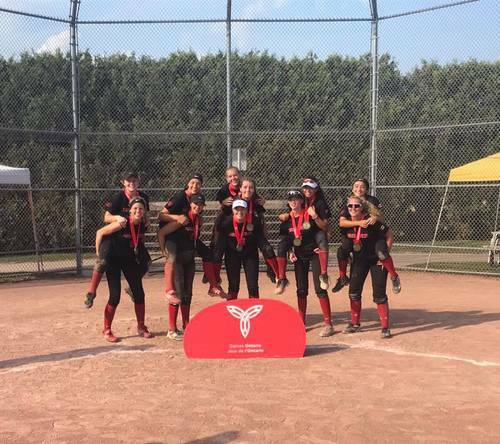 In a whirlwind season that started last September, taking the team all over Ontario, and into several US events for the first time…there was no better way to cap the season of 2018 then with a first place finish for our 2K2 team at the Ontario Summer Games. The gold medal this past weekend, marked a nice two week run for the club as this gold medal win came on the heels of the provincial silver medal the previous weekend in Cambridge. The Ontario Summer Games experience was a first for all of our athletes. Taking part in the opening ceremonies Thursday, to pool play Friday, playoff rounds Saturday and Sunday it was an awesome four days for the team. Staying at the University of Western, the team ate meals together, slept in the dorm, and best of all – played some awesome softball. The Sunday final was a rubber match between UTM and Waterloo Gold, each side winning once earlier in the tourney. The Ghosts jumped ahead early with a 5-run lead… however the team battled hard over the final 5-innings and when the final out was made the 2K2 program celebrated a 8-6 win over Waterloo, winning the Gold Medal. Waterloo earned Silver, and Brampton earned the Bronze.